There’s a couple of reasons people are put off buying vintage garments, be they wool or otherwise. Smell and moth-holes. Both are kind of instant an instant turnoff. The smell we know as “le vintage”, the reek of a thousand army surplus garments that have been in a dank basement since D-day. And then that great wool greatcoat, all brass buttons, sharp labels and flowing length, and ventilation courtesy of a hard-working family of moths. A deep sigh and back on the hanger it goes. Or into the box. Or, might there be salvation after all? A wool greatcoat on a Saturday morning? Indeed! Really I wanted to inform you that I just posted a guide to removing that «vintage smell» from old garments, and how to repair holes made by moths and such. It’s a proper crafty piece and I know many of you will enjoy and benefit from it. What better way to start the day than watching me repair a vintage wool greatcoat? I hear you thinking and the answer is «not even close». Air it in the sun. Doesn’t do much, even after a couple of months, it’s decorative though, in a strange way, having vintage garments on display. Put it in the freezer. Again, doesn’t actually help, though it feels proactive. Take it to the dry cleaner. Maybe, possibly, but do their chemicals remove actual dirt? What works is water and detergent. I have no hesitation in washing most wool and army surplus in either a bucket of water or the washing machine. Using a wool programme and a wool detergent, at 30-40 degrees Celcius, there is little chance of damaging or shrinking the garment. You’ll want to stretch it out and lay it flat for drying though, to avoid deformation and to save yourself some of the steaming afterwards. Yes, once dry it’s the steam iron to make it nice and flat again. The smell will almost certainly be a distant memory though. And it’ll be clean. An old tweed jacket can be quite disgustingly filthy, even though the wool weave may do a good job of disguising it. Barbed felting needles and styrofoam block. Wool fibres to be mixed and used to fill the hole in the garment. The wool should either be a very close match to the wool that is missing, or you need a pack of colours so you can mix the fibres up. If you’re uncertain about how mixed wool fibres look, try looking at a piece of Harris Tweed and go in really close. You’ll see how the weave is made up of two yarns, but looking closer you’ll see it’s made up of many primary coloured fibres, quite haphazardly mixed to give a colour that looks quite uniform from a few paces away. (Click here for more info on this). I’ll admit, I’m no super-experienced felting master. I heard about it, researched it, bought the necessary items and had a go. And to be totally honest, it’s not that hard. At least not to do it just well enough to be passable. I’m sure there are Jedi-level felters around that can make totally invisible repairs, but unless you’re looking at quite large holes, it’s not that difficult or that much work to make a repair that is decent. A wool greatcoat with holes made by hungry moths. You’ll quite quickly realise how it works, and how you can do it better next time, so it pays to practice on something that is not your grail project. 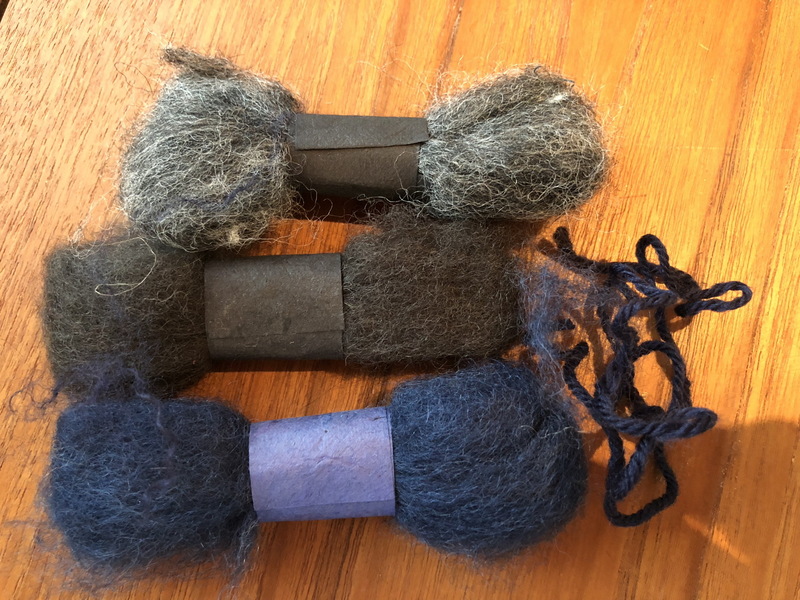 Success really comes down to how handy you are stabbing away with the needle, and how much care you’ve taken when finding and mixing your wool fibres. At the end of the day though you’ll have saved a vintage piece of wool clothing, learnt a new skill, and put something of your self into it (be careful with the sharp needle, no need to add more of your self to your work than necessary!). Having got this far, I also made a little video you might enjoy. I hope you feel inspired! Here we see the result of mixing wool and felting it into place, fully covering the hole made by moths. And finally, a video demonstration! Thanks a ton for showing how to repair moth-holes! I have always been wondering if/how those holes can be repaired. You have just answered one of the last really important questions. Another useful item is an activated charcoal filter. As for washing with detergent, it definitely has some advantages. But I would be hesitant to use it on tailored garments. I have a vintage dinner suit that reeked when I received it. I put it in a bag with the filter for several days. The smell was completely gone. Then it was off to the dry cleaners. Came back still smelling a bit of the chemicals used by the cleaner, so back in the bag with the filter. A few days later, smell was completely gone. The moth hole repair method is fantastic. Taking it to be professionally repaired is often more expensive than the garment itself. I’v tried washing various surplus items. On a few occasions there was almost disastrous foaming in the washing machine-is suspect it was something the items were treated with (they were French army surplus). Obviously, would not have been an issue if I did it in a bucket or bathtub. Thanks for a great tip, I’d no idea that felting was so damn simple. I’ve passed on some lovely garments over the years b/c I didn’t think the holes were fixable. No I know that they are. This is great Nick, thanks. I’ll have to try this for my French great coat which was in perfect condition when I bought it, but back then I was naive about moths, and they since munched part of the sleeve. I’d thought maybe I could sew a badge over it but would rather not. This could be the best solution! I am always looking for new methods to repair moth holes as I buy a fair bit of vintage and this has been most interesting. I have a pair of wool surplus trousers that I intend to repair and having removed the side cargo pockets, have a source of matching wool. Do the wool fibres need to be in a fluffy form as shown, or do you think I could achieve good results by cutting a patch, fraying the edges and felting it into place? I think if I was going to repair a sizeable hole I’d make an oversize patch and just felt in around the edges, but for smaller holes, say a quarter inch or less, I’d flyff the wool up and felt the entire damaged area. Would be interested to hear how you get on! Hey Nick, so my felting needles arrived and I gave it a go on some scraps. It is surprisingly easy. I did it in layers as shown in your video to build up the thickness. Very encouraging and I can see this coming in handy in the future. 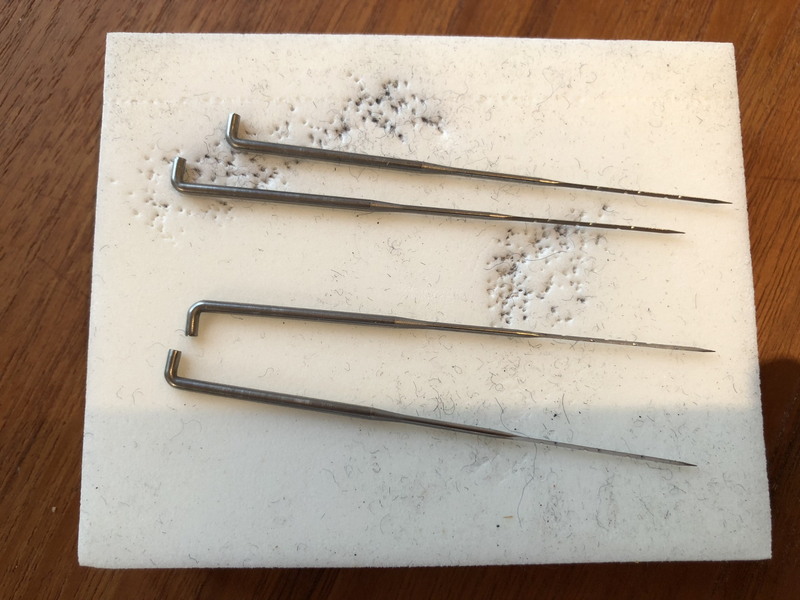 I have one small addition to your method-the constant pocking leaves an indentation in the patch area-To further disguise the repair I push the patch up with my finger and use a clothes brush to raise the nap and blend it with the rest of the cloth-thereby making it almost invisible.